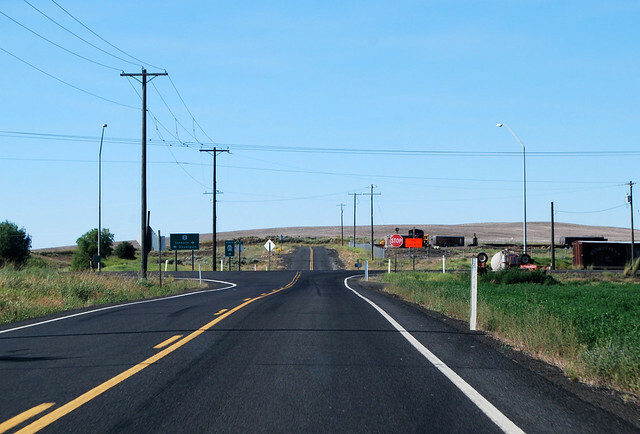 On Saturday, July 20, 2013, we drove the length of Washington State Route 231, a highway longer than its "parent" route, Highway 23 -- the only such situation in the state, actually. 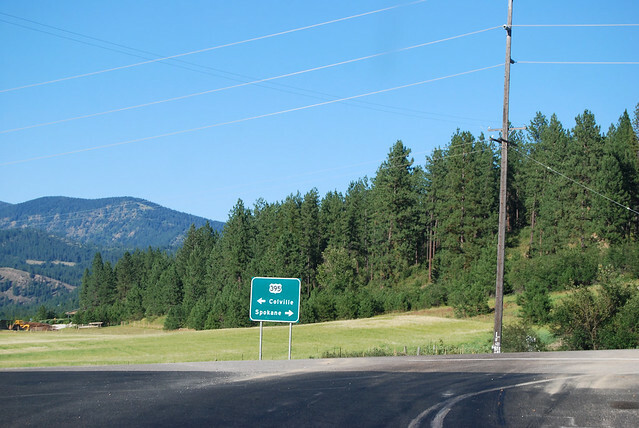 Late in the afternoon, we arrive at the south end of Highway 231, just a short distance on SR 23 from I-90. In the backseat of our car are Chunlin's brother and his son, visiting from China. 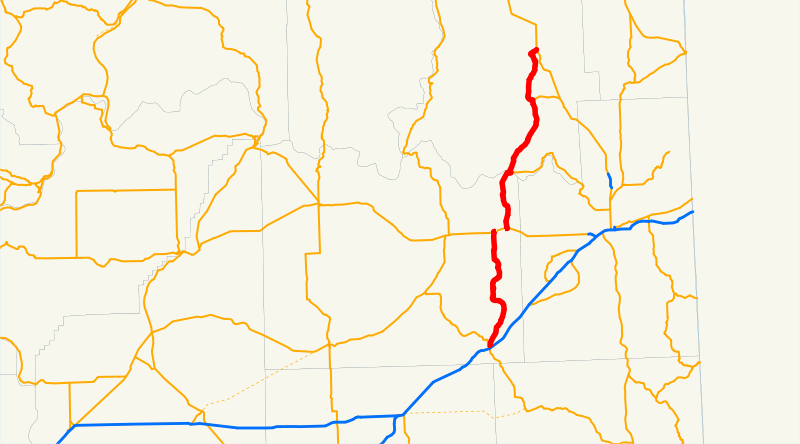 Thus this route is now "World Famous" Highway 231! North we drive, over and around the rolling farmland of Lincoln County: vibrant green, glimmering gold, and drab brown. Hay is scattered across the highway, blown from fields and passing trucks. Bits of the road are fresh pavement, fifty yards at a time. We wind back and forth and up and down, zig-zag through the town of Edwall, then back to the rolling fields. The quiet road eventually reaches a junction with US 2. Turn right to continue on SR 231, so says the sign. 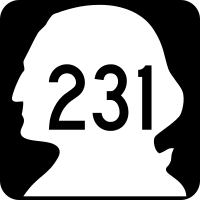 In Reardan, SR 231 starts up again after that brief, signed concurrency with US 2. Heading north. Highway 231 traverses a large pond just north of Reardan, on a causeway. Flocks of birds fly across the road ahead of us. One little bird decides to run across the road instead. It doesn't look like a chicken... Fields of baled hay look like herds of animals. So do actual herds of cattle. As do the camels. 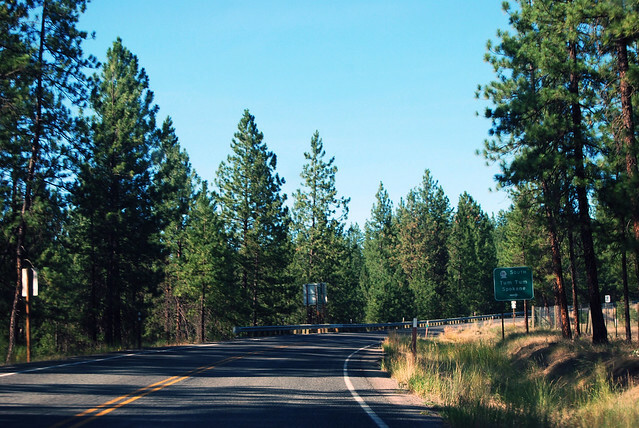 The farmland disappear as we drive down forested Spring Creek Canyon, which reminds Chunlin of Highway 20. Then it opens back up again, but soon dips to the Spokane River. I drive slow across the bridge so we can get a glimpse of the Long Lake Dam upstream. 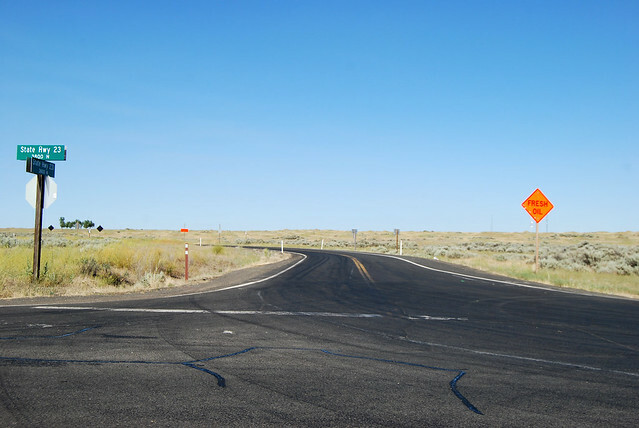 Shortly after the bridge, SR 231 has a junction with SR 291. Tum Tum? We drive through a sparse pine forest till the town of Ford, then we break out into Walkers Prairie. It's a wide valley of farmland with tree-covered ridges all around. 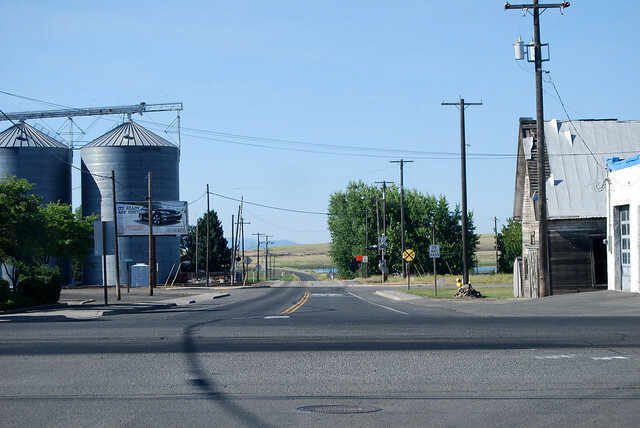 Soon, though, it's rodeo time in Springdale and we come to a junction with SR 292. 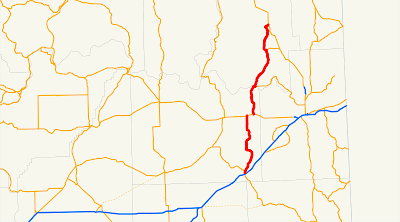 We also join the Great Northern Railway branch from Spokane to Canada at this point. After briefly turning south to leave Springdale without any unnecessary elevation gain, we head north into the Colville Valley. Highway 231 hugs the east edge of the fields, tightly against the base of the hill. Milepost 68.9 -- ponder it. We pass Bulldog Creek Road, which used to be SR 232, but is no longer as such. The town of Valley is still in the valley, and shall be forevermore. A bit further and the highway turns east and we reach US 395. The drive is done. Well, that was nice. And I think my passengers stayed awake for most of it! The sign was warning of the newly paved bits, although they weren't too oily or fresh on the day we got there. 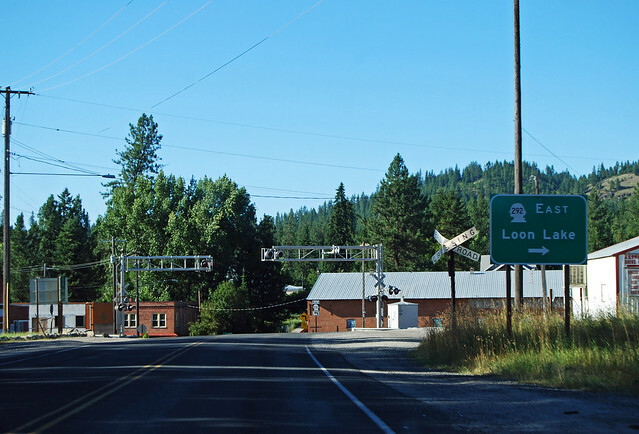 I was happy to find this when googling Washington Hwy 231. It was a fun drive for me, following your text and pictures. I grew up one mile off of 231, on Bergeron Road, which terminates on 231 a short way before the Hwy dips down into the canyon. Glad you posted!